In June 2017 I had the joy of partial planning the marquee wedding reception of Hannah & Owen. Key suppliers had been hired but they needed some assistance with the design + logistics of having a marquee reception at home. I feel blessed to have such lovely clients and Hannah & Owen and the whole family were no exception. The ceremony was in the local St Mary’s Church, Bishopsbourne, Kent. Hand on heart some of the nicest ushers and bridesmaids I have met, all willing and happy to help in whatever way they could. When guests arrived they were greeted with substantial canapés, drinks and oysters. The canapés were in lieu of a starter so there were lots! We had music from Joshua Doughty who played the kora, an instrulment I must admit not knowing beforehand. The gardens included a beautiful mini woodland which when you follow a path leads you to a scenic viewing point over the countryside. We had a bottle of champagne and glasses waiting for whoever found them first. During the drink reception Lisa was taking polaroid photos of guests who then wrote little messages before we pinned up in the marquee. Dinner continued the relaxed but luxury atmosphere by having a selection of food served family service at each table. The pudding was their wedding cake but served with coulis, cream and berries. The marquee was the stunning oyster pearl tent from the pearl tent company , I’ve worked with the pearl tent team a few times and love their structures, so beautiful. The design was understated luxury showcasing the beautiful gardens of the brides parents. Hannah and Owen wanted all their friends and family to feel welcomed at their wedding, a lot of thought went into the flow of the day as well as the marquee design. As a marquee wedding planner, it is my role to not only work through all the logistics of a marquee at home, but also to guide and advise in terms of the design. We wanted all the sides of the marquee open in order for everyone to appreciate the beauty of the surroundings; we ensured the marquee was in the optimum position with open walls on 3 sides. 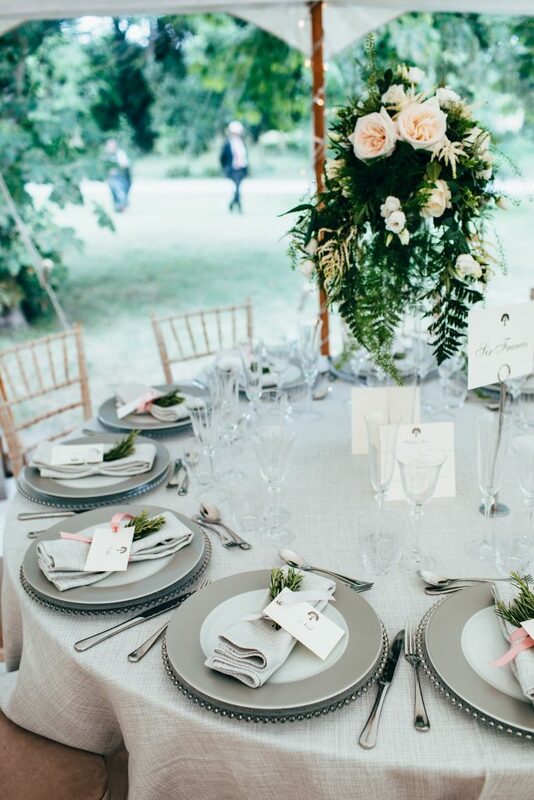 Although the marquee felt very natural we embraced luxury with the table settings. We hired some gorgeous dove grey textured linen then used couvert for their stunning crockery, cutlery and glassware. A local florist dressed the top table backdrop and tables with lots of foliage and roses, we included a sprig of rosemary on the napkins which smelt divine. After dinner guests continued to mingle in the garden whilst the evening band set up. On the bar we had local beer, wine and gin cocktails with dried oranges that Hannah had personally cooked in her oven! When the evening guests arrived they were handed bento boxes with curry. Which they loved! As mentioned in previous posts my role as a marquee wedding planner means I’m on site a lot! On the Friday Lisa and I didn’t get home until midnight, back on site for 9am then home at 3am on Saturday. At least it keeps me fit! If you are organising a marquee wedding and would like to enquire about my wedding planner services please do get in touch . 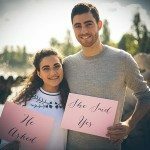 You might also find this article interesting highlighting some surprising statistics with marquee weddings.